Carrots and coriander have a wonderful affinity for one another. 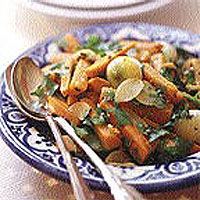 In this recipe, they are slowly cooked together in a Moroccan style, utilising both the coriander seeds and the leaves, alongside a little cumin and orange. You can serve this dish either as a starter with a salad of small spinach leaves, as an accompaniment to a rich beef or lamb casserole, or perhaps with a lemon-and-paprika-spiked roast chicken. Toast the coriander and cumin seeds in a dry, non-stick frying pan over a medium heat for a minute or so. Remove and set aside. Heat the olive oil in a large frying pan over a low heat, and cook the carrots, onions and garlic gently, stirring from time to time to prevent them browning. Add the toasted spices after 5 minutes and cover the pan. Continue cooking for another 10 minutes, or until the carrots are tender. Finally, add both the orange zest and juice, before seasoning with salt and pepper and serving with the coriander leaves scattered over the top.